We’re big fans of dried mushrooms here at Earthy Delights. After all, 2016 marks our 30th year in the mushroom and wild foods business. While a lot has changed over the years, with the rise of new technologies and new ways of doing business (remember life before the internet or even personal computers? ), our genuine love of fresh and dried mushrooms has remained steadfast. Why should anyone care about dried mushrooms? To start with, edible mushrooms are a wholesome and healthy package of protein, minerals and fiber. With so many giant food corporations using the word “natural” on their packaging, it’s a relief to know that there are still some foods that really ARE 100% natural. Our dried (and fresh) mushrooms are just that: no additives, no chemicals and no preservatives – nothing but pure, unadulterated mushrooms. Dried mushrooms are one of the handiest foods to have in the kitchen. They require no refrigeration or special handling, lasting for many months in a tightly sealed container. Keep them in a cool place away from the sun for six months or more. For longer storage, pop them into the freezer where they will remain perfectly preserved indefinitely. Last, and perhaps most importantly, dried mushrooms taste great; they add remarkable flavor and pleasing textures to many of our favorite dishes that wouldn’t be the same without them. 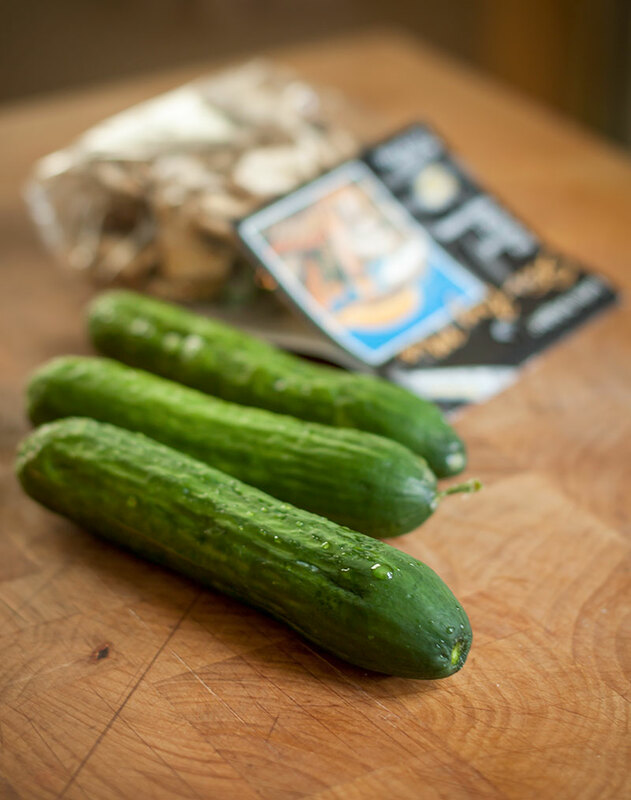 Just check out the following recipe, our interpretation of a classic Chinese dish that features the delicate flavor of our own dried stir-fry mushroom blend, together with an unexpected ingredient – fresh cucumbers. Stir-fried cucumber can be a revelation if you’ve never imagined eating it hot. 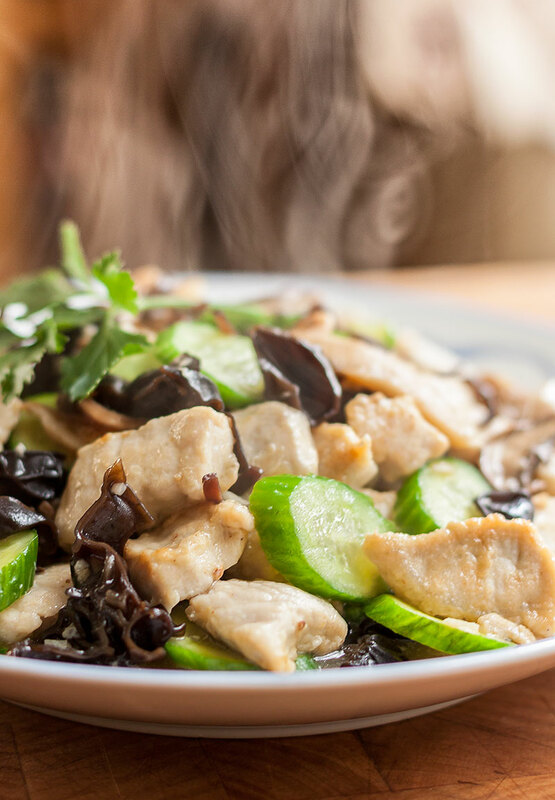 This recipe is a simple and harmonious union of quickly stir-fried pork, sliced cucumber and mushrooms, resulting in a dish which is delicate in flavor, but immensely satisfying. 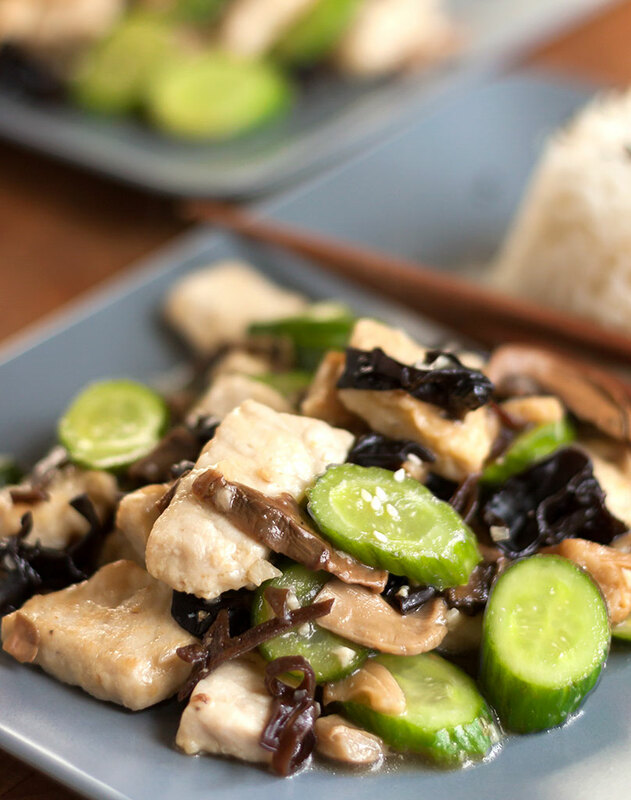 If you prefer, you can easily substitute chicken or tofu for the pork. Reconstitute the dried mushrooms by soaking them for 20-30 minutes in enough warm water to cover them completely. Strain, reserving the soaking liquid for later use in this recipe, if desired. 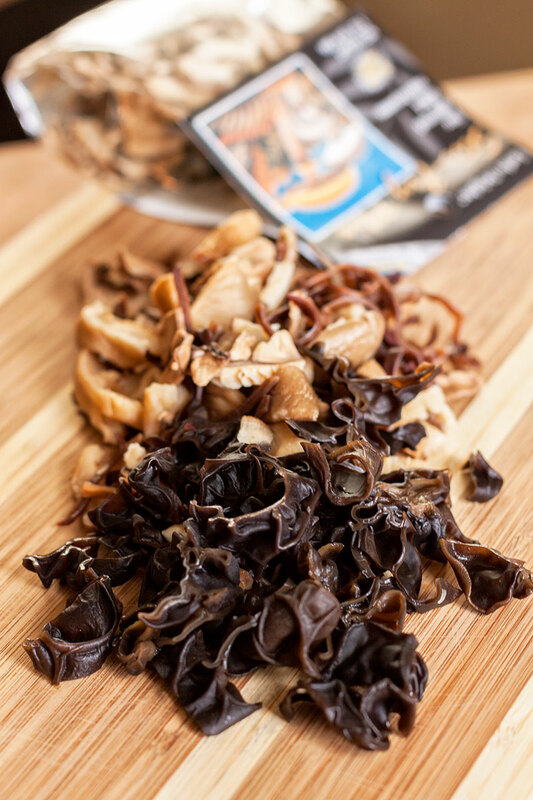 The dried mushrooms in our handy Stir-Fry Mix are pre-sliced, but if there are any large pieces, chop them coarsely. Set the reconstituted and drained mushrooms aside until needed. Mix all of the marinade ingredients together in a medium bowl. Trim any excess fat and tendon from the pork, but don’t worry about getting every little bit. Slice the pork about 3/4 inch thick and cut into bite-sized pieces. Mix the pork thoroughly with the marinade and set aside for 20 minutes. Slice the cucumber diagonally 1/4 inch thick. Mix together the salt, sugar, chicken stock/mushroom liquid and set aside. Heat the oil in a heavy non-stick pan or wok over medium heat. When the oil is hot, add about half of the pork slices, taking care not to overcrowd the pan. Cook, stirring frequently, until the meat is opaque and lightly browned around the edges, about 2-3 minutes. Remove the cooked pork from the pan and drain on paper towels. Repeat until all the pork is cooked. Pour off all but 1 tablespoon of oil from the pan and return to the heat. Add the garlic and reconstituted mushrooms and stir-fry for about 30 seconds. Add the chicken stock mixture and raise the heat to medium high. Bring to a simmer and cook until the mushroom pieces are quite tender, 5 – 10 minutes. Add the cucumber slices, pork and dry sherry to the pan. Cook for a minute or two, until the pork and cucumbers are heated through, then stir in the cornstarch/water mixture. Continue to cook until the sauce is slightly thickened, about 2 minutes. Remove from the heat and spoon onto a decorative platter. Drizzle with a few drops of sesame oil, if desired. Serve with steamed rice.